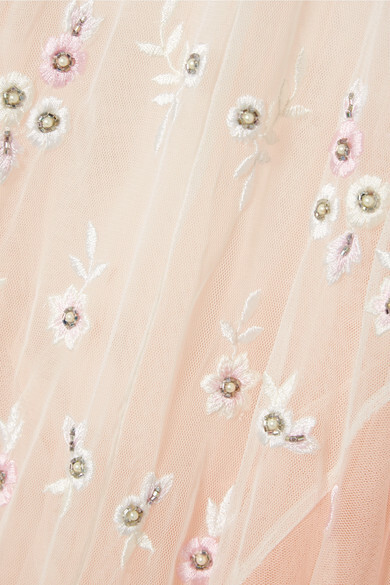 Needle & Thread's gown is embroidered with dainty flowers inspired by Victorian lace. Made from layers of airy tulle, it's intricately embellished with faux pearls and mirrored beads, and finished with a detachable silk-satin ribbon at the back. The ombré color palette graduates from white and ivory to blush - perfect for the bride who wants a subtle touch of color on her big day. Shown here with: Jimmy Choo Clutch, Stuart Weitzman Sandals.